Samantha Morris from Gold Coast magazine Blank interviewed me about my life of puppetry that eventually became a career. – Brett Hansen, Larrikin Puppets. Obsessed with the work of Jim Henson on Sesame Street, The Muppets and Fraggle Rock since being a young child, Brett Hansen puppeteered his socks, handkerchiefs and tablecloths before his parents bought him his first puppets. He’d wear those puppets on his hands as he watched Muppet shows, obsessing over behind-the-scenes documentaries. Although his puppet collection grew as he got older, and he practiced performing at school and for his family, for most of his adult years, it was simply a hobby that had nowhere to go. Until 2012 when an opportunity came up that was too good to ignore. Samantha Morris fired off a few questions to the Brisbane-based puppet man who is on the Gold Coast every other week. How did you get into puppetry? I auditioned for a local production of Broadway puppet musical Avenue Q, which is a parody of Sesame Street. I scored a role co-puppeteering two characters and also training the entire cast of actors, as I was the only one with puppetry skills. At the end of that year, my first marriage ended and I was made redundant from my day job. So, through the New Enterprise Incentive Scheme (NEIS), an unemployment program for people wanting to become entrepreneurs, I picked up the pieces of my shattered life and started my own puppetry business. You were a member of circus metal band Headkase for twelve years. What skills did you take across from music to puppets? I also played in a ska band, an experimental noise art band, and an ambient quintet. And for the last six years, I’ve performed piano for improv theatre shows by groups such as ImproMafia, Edge Improv and Youth Theatresports. For my puppet shows, I’ve written and recorded songs on the keyboard for the puppets to sing. For birthday party bookings, I ask the parents a series of questions about the birthday boy or girl, and then incorporate the information into some personalised songs which seem to go down a treat. It’s always a risk throwing yourself into a creative business. What have some of the challenges been? For a while I did have to go back to a full time job in a call centre, as puppet bookings had slowed down. But a few months into the job, I was starting to receive a lot of booking enquiries for weekday shows at childcare centres and schools. It didn’t make sense to have to turn down these bookings and it was looking like the call centre was on the verge of firing me anyway due to difficulties I was experiencing there. So my wife and I agreed that she would support me through the growth of the business, and that we’d take the financial risk together. And it’s paid off! What sort of work do you get? I perform shows during the week at childcare centres, schools, and occasionally at libraries. On weekends, I perform at festivals, school fetes and birthday parties. I’ll get gigs at shopping centres, resorts, restaurants, play centres, hospitals, special schools, hotel function rooms, nursing homes and seniors clubs and I sometimes get asked to perform roving puppetry at street festivals and corporate events. And then there’s my puppet MC work. And at least once a year, I’m asked to perform puppetry for film or television. New York is home to a massive community of puppeteers and enthusiasts. It’s where Sesame Street is filmed and puppeteers perform weekly in theatre and at festivals and there are regular training courses at venues like the Brooklyn Puppet Conspiracy and The Puppet Kitchen. You spent some time in New York City recently. Tell me about that? During my three months of professional development there, I immersed myself in that puppetry community, participated in absolutely everything I possibly could, attended every puppet show and workshop, and made a whole lot of friends in the process. I brought my whole puppet stage and puppets with me too, and performed at the Puppetry Arts Festival of Brooklyn – a festival dedicated to puppetry of every form. The Puppet Kitchen was like my second home. Puppeteers at every level attended ‘monitor puppetry’ nights to brush up on film and TV puppetry skills. I even puppeteered in a video web series called The Fuzzy Beard Show, and another called The Mo Show. We spent a week in Los Angeles where we spent some time with Henson puppeteers Grant Baciocco and Russ Walko and checked out the Jim Henson Company studio with its iconic Kermit the Frog statue out the front. Another week was spent in Denton doing the advanced, intensive “Beyond the Sock” puppetry workshop at University of North Texas. 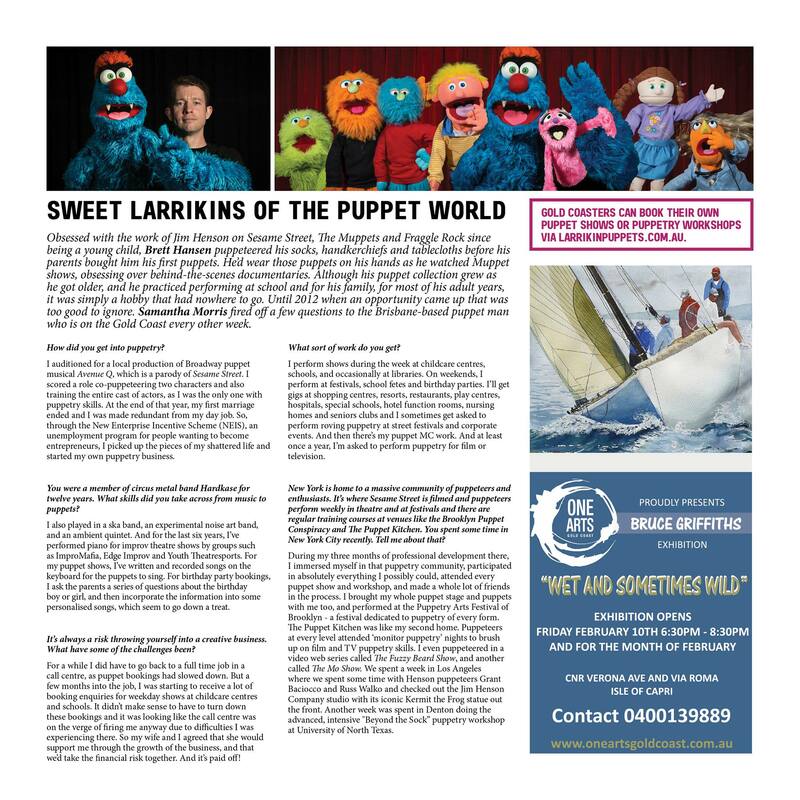 Gold Coasters can book their own puppet shows or puppetry workshops via larrikinpuppets.com.au.